The Custard TV: Case Histories returns with a confusing opener. Case Histories returns with a confusing opener. Sunday evening saw the return of Edinburgh-based crime drama Case Histories. 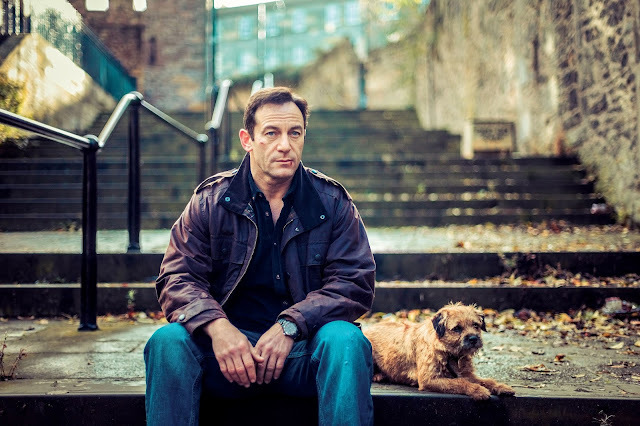 Jason Isaacs reprised his leading role as complicated private investigator Jackson Brodie in the first of three 90 minute episodes adapted from Kate Atkinson’s novels. I hold my hands up – I’ve not read any of the books, and after this episode I sincerely wish I had. I can’t have been the only one getting ever so slightly (okay quite a bit) confused by the relentless switching back and forth between lots of intertwining storylines and the rising body count. That being said, there was a dog, a very cute dog, and a fantastic cast and (even if I’m extremely thankful for the rewind button on my remote) I did enjoy it overall. Convinced he has made a vital mistake over a child abduction case in Munich, Jackson deals with his guilt the only way he knows how, by, well brooding a lot of course but then ploughing straight into another case – perhaps Broody would have been a more suitable surname? Completely off course I know. The Munich job went awry after Jackson, under the impression he was saving a young girl and returning her to her mother, unintentionally ended up abducting the girl from her real mother and giving her to a group of suspicious men. With his ex-wife and daughter living in New Zealand and DC Louise Munroe (Amanda Abbington) having washed her hands of him, in true Jackson Brodie form he had plenty of personal battles to deal with throughout this episode. After rescuing a border terrier from the grips of its’ cruel owner Jackson unintentionally adopts the animal (brilliantly called ‘The Ambassador’) who then proceeds to follow him around for the remainder of the episode. Upon returning to his office he is greeted by an, it’s fair to say, furious Deborah who it seems has single-handedly held the fort while Jackson has been away in both New Zealand and Germany, or maybe just Germany? No one was really sure! Jackson meets a young woman called Hope McMaster who wants his help finding her birth parents. Having been adopted at a young age and having lived in Australia for the majority of her childhood, the only clue Hope can give Jackson is that she used to receive Christmas cards from ex copper Ray and his wife Margaret who she believes both live in Edinburgh. Through flitting between various storylines we were introduced to Tracy Waterhouse, played by comedian and writer Victoria Wood. It was great to see Wood show off her acting talents as Tracy, a retired policewoman turned store detective who is forced to take (debatable) action when she witnesses the physical abuse of a young girl called Courtney by her mother, Kelly. Tracy hits Kelly, a regular shoplifter (also later revealed as a prostitute), in an attempt to protect and help the young girl. By this point we know that Tracy has actually taken Courtney and is hiding her in her house (definitely a debatable action) and feeding her lots of sweets which, from my own childhood experiences, is one sure-fire way to keep a child happy. Jackson’s search for Hope’s birth parents leads him to a murder case from the 1970s with the murder victim a prostitute called Carol Braithwaite. In the Braithwaite file he also discovers a picture of a young child and assumes it to be Hope. His discovery points him in the direction of Tracy who is named as one of two police officers (the other being her former police partner Barry) first at the crime scene. Jackson visits Tracy at her house and she explains that Carol had been dead and locked in her flat for three weeks before they found her, along with her young son Michael who was still alive. Michael was immediately taken to hospital and was suspiciously accompanied there by a former senior policeman, Len Lomax. Jackson soon realises that Michael is the young child in the photograph, not Hope which leads him to tell her that he’s not sure he can help her case any further. Tracy later tells Jackson of her guilt over not doing more for Michael, who disappeared soon after being taken to the hospital, and her undeterred determination to help Courtney is then fully understood. While at Tracey’s house Jackson sees Courtney and quickly suspects that she is not actually her child. He visits her store colleague Rod and his suspicious are soon confirmed – Rod tells him that Tracy has no children but had wanted to know Kelly’s home address. The situation takes a turn for the worse when Jackson finds Kelly dead at her home as she has been the latest victim of a serial killer who has been killing prostitutes. Consequently, Jackson and Louise briefly reunite to watch CCTV footage from the shopping store car park and discover that Tracy had actually paid Kelly for Courtney, as you do! We then follow former senior policeman Len Lomax as he suddenly, and quite urgently, wants to visit an old police colleague who just happens to be Ray, only to find him fallen out of his wheelchair stranded at the bottom of his stairs, and Margaret dead in the bathtub having committed suicide. I did like how the scenes changed quickly from slow build-ups to dramatic climaxes quite frequently. Keeping up? Not only is the body count slowly rising but Jackson is also convinced that someone is impersonating him. Between threatening phone calls warning him off digging for information on Carol Braithwaite (before he had even discovered her case), and Lomax insisting to DC Munroe that Brodie stop harassing him, it is clear that there is another Jackson doing the rounds. After a pretty savage beating by a couple of thugs warning Jackson off the Braithwaite case we find out that another private detective, coincidentally called Jackson too, has been hired by the presumed missing Michael to investigate his mother’s murder. And that’s that mystery solved! After grilling Barry, Jackson finally starts to unearth the truth; he discovers that the Braithwaite murder case is embroiled in police corruption. Our undeterred inspector confronts police buddies Ray and Lomax where Ray eventually admits that he had fathered a child (Hope) with Carol and that he had killed her while visiting her drunk. He explains that during a police ball he convinced Barry to drive him to Carol’s flat and she had told him that if he did not pay her money she would stop him from seeing his daughter altogether. In a fit of rage Ray killed Carol but was unaware that Michael was also in the flat; Lomax, being a senior policeman at the time, had then helped cover Ray’s tracks. A flashback shows that Margaret had committed suicide after realising what her husband had done, saying that she could have learnt to love his daughter if he had only told her the truth. 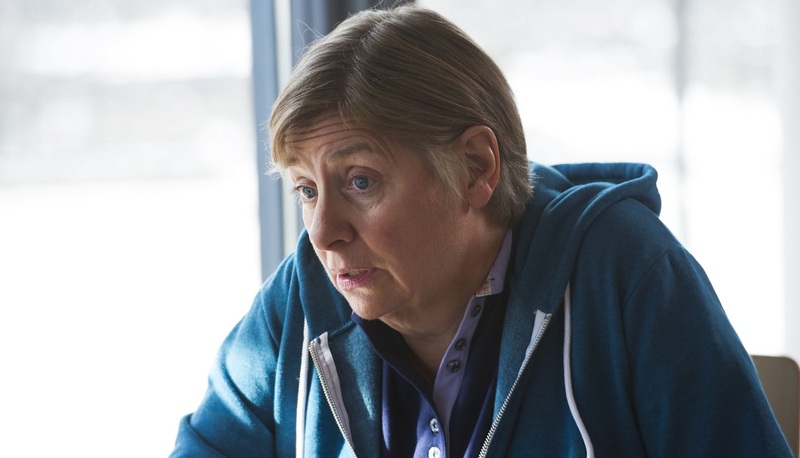 Following Ray’s revelations, Jackson unsurprisingly goes above and beyond to make it possible for Tracy to continue looking after Courtney by making a hard bargain with a very suspicious German man. In return for two new identities for Tracy and Courtney Jackson promises that he is in the debt of the shifty guy and this is obviously going to come back to haunt him. The episode concludes with Hope reunited with Michael and she agrees to take The Ambassador off Jackson’s hands! Did it live up to the first series? For me, not yet but with two more episodes to go I’m more than optimistic. This one was definitely a grower and by the end I was happy with how the different storylines eventually linked together; some parts were a little confusing and some were a little unrealistic but Isaac’s fantastic portrayal of the difficult but kind-hearted Jackson Brodie leaves me definitely wanting more, and with a stellar cast surrounding him it’s a thumbs up for yet another great British crime drama. Wish he’d have kept the dog though!